Teddy Tanks are unique stuffed animals that come equipped with a fish bowl for a belly. What makes Teddy Tanks special is that kids can actually turn them into fish tanks for live fish. To place objects inside the Teddy Tank, one simply places the item inside of the stuffed animals mouth and it drops down into the belly. 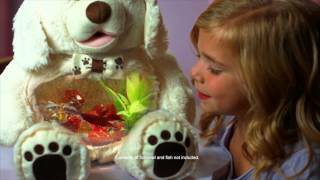 So when the fish need to be fed, children can place the fish food inside the stuffed animals mouth. Teddy Tanks can also be used to store toys, money, and valuables. They can be decorated with bow ties and are available in twelve different characters. Teddy Tanks are the amazing stuffed animals that double as awesome fish tanks! Teddy Tanks are cuddly characters that can actually be used as a fish bowl for live fish! Kids will love taking care of their fish with their new soft and snuggly friend. To feed their fish, they simply place the fish food inside the stuffed animals mouth! Teddy Tanks are available in twelve different characters that your child will love. They can be used to store other items as well, such as money, toys, and valuables! Teddy Tanks are also a great way to teach kids responsibility! The cost of Teddy Tanks is $19.99 plus $7.99 shipping, for a total price of $27.98. 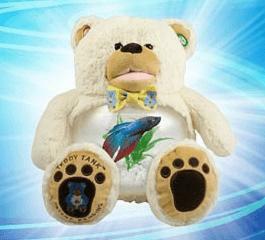 Teddy Tank doubles as a fish tank and can be used to store live fish or a wide array of toys and valuables. Children place things inside by putting them through the mouth of the stuffed animal. HOW DO YOU GET THINGS INTO THE TANK (I.E. FISH FOOD, COINS, TOYS, CANDY)? You simply "feed" your Teddy Tank through the mouth. HOW TO CARE FOR A TEDDY TANK AS A FISH TANK? If you are using Teddy Tank to house a Betta Fish please remember to treat the fish and all pets with love and care. Parents please supervise your child when caring for a pet. Remember this is a one gallon fish bowl, which will need frequent water changes. It is super easy to clean because you can remove the plush animal body from the one gallon plastic bowl. (Visit our "Tips & Instructions" page to see how to set it up.) Below are a few facts to consider about Betta Fish. Visit your local pet store to see how to properly care for a Betta Fish in a one gallon plastic bowl. WHAT TYPE OF FISH DO YOU RECOMMEND FOR TEDDY TANK? We recommend Betta fish for Teddy Tank use. Betta fish require minimal maintenance and are a great beginners pet for every child. Just remember, only 1 fish per tank. Bettas live up to 4 years with proper care. FOOD: We recommend using Betta Fish Pellets for the Teddy Tank. Feed the Betta sparinlgy 3 times per week. Only feed the fish what it can eat in 3-5 minutes. Overfeeding can harm the fish and cause the water to be really dirty. The plush "animal" is easily removable from the tank, and its washable! At this time it is also much easier to clean the tank separately as well. HABITAT: Bettas breathe from the surface of the water and prefer water with little or no current due to their long fins. Male Bettas normally live by themselves in smaller containers or aquariums. They do well in a half gallon bowl or larger. Do not place more than one Male Betta in the same bowl. Bettas acclimate to household temperatures. Do not place the fish tank in direct sunlight or in a drafty area. Water temp. 74-82 F.